This past Wednesday we did something incredible and selfishly rewarding. 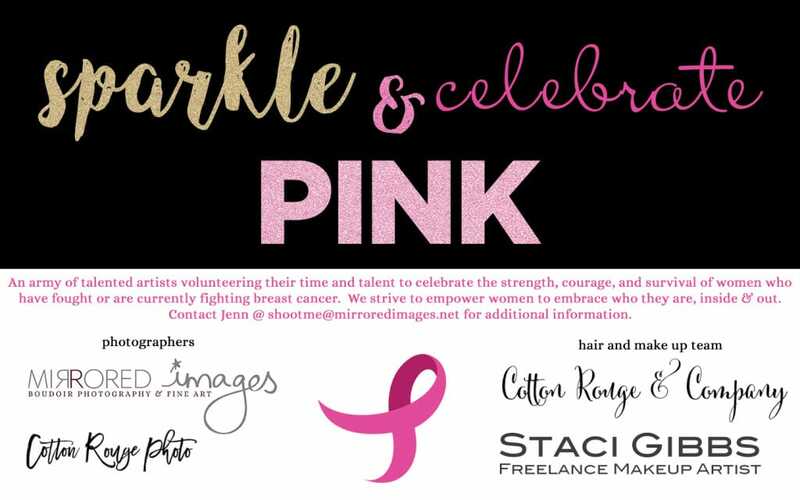 Sparkle & Celebrate PINK was created to raise breast cancer awareness, as well as to celebrate the strength, bravery, and survival of women who are in remission or currently fighting. Women, in general, have body image issues and struggle with self esteem and confidence. As artists, specifically boudoir photographers, it’s our mission to help women begin to overcome these obstacles. When women go through an experience such as breast cancer, the emotional and physical challenges become greater. We wanted to help women celebrate their bodies, begin to accept the physical and emotional changes they’ve endured, and have the chance to celebrate their story. To hear more about our reason why, see our segment on CBS/Atlanta Plugged In. Can I just tell you how emotional but uplifting the day was for all of us? There were many moments we all had to hold back the tears and by the end of the night we (the artists) already chose two dates for 2018 to sponsor this event again. Please share these images of inspiration so others can have the option to take part in the 2018 dates. Women can begin to contact us now to participate next year! We will have a date in Taylors SC & in Gainesville GA.
Five beautiful and inspiring women participated, four survivors and one currently battling. They lifted each other up, celebrated each other, shared their stories with us, and I’m confident they will remain in contact for years to come 🙂 Justin with Stearns Media Group produced a behind the scenes video that included interviews with the ladies — scroll down to see that OR click here for our YouTube channel.